I happen to know that some of you have never played Portal, and therefore put up with my constant references to the game with good-natured befuddlement. Well, be befuddled no longer! Until Monday you can download and play the game for free from the game creators on your PC or Mac. You'll have to create an account (also free) over on Steam to do so, but hey, that's worth a $10 game, right? Go here and click "install game" under Portal to grab it. And then have fun! WITH SCIENCE. Oh my gosh, thank you so much for sharing this! I have wanted to play, but couldn't justify the money to buy another game! For clarification, you can get the game and you'll get to keep it forever. Not just until Monday. I've shared the info on this with others, and they thought that after Monday they couldn't play it any more. Also, I think it's kinda interesting to share the link about why they are giving the game away. Oooooooh! My boyfriend just introduced me to Portal, so now I can play it myself. I need to show all of not-as-geek-savy friends too, so they won't look at me funny when I go, "I'm in spaaaaaaaaaace!!!" I linked my readers this morning so they could get my obsession with companion cubes and cake=lie references. I hope everyone takes us up on it! Downloading! Thanks for the heads up, I needed a new time waster since my previous computer kerploded taking everything along with it! Can you play on a laptop or does it have to be with a mouse? I'm so interested in playing but I only have lappy at home. Anony, I *think* you use the keyboard to play, but since I played on Xbox I'm not 100% sure. Anyone else care to chime in? You use the keyboard to move, but you use the mouse to control where you're looking. Also the left and right clicks control the orange and blue portals. So you COULD do it on a laptop using a trackpad, but it'd be difficult. You'd be better off with a mouse of some kind. It's very much a move-with-your-keyboard, aim-with-your-mouse thing. The portals a done with the left and right mouse buttons. So it *might* be possible with a laptop trackpad. But it's not going to be nearly as easy as having a mouse to use. "Your account creation request failed, please try again later." Maybe this offer is only for people with existing accounts on steam? Thanks Jen!!! I've been wanting to play Portal for a while, now I have the perfect excuse. You are the best. Wow, I seriously just screamed... (And hi. I haven't commented before.) I'm pretty sure you CAN play with the keyboard, or as far as I know. Either way, I'm downloading it. This is awesome and I hope Steam works out for people. I personally spent a great deal of my PC gaming time fighting Steam trying to get it to work every time I wanted to play a game. Ultimately ended up giving up and deleting Steam, loosing around $70 worth of games because I could never get it to work right. @Anon and Jenn ~ It is played with the mouse and keyboard. Now, it it like last time and you only get a shortened version, or do you get the whole game? Because last time they did this I got it and found out just a few days ago I got a shorter version. I downloaded this earlier today thanks to a heads up from Woot.com. You can play with a laptop, but you do need the mouse to look around and aim. The keys move you, but the mouse steers you. If that makes sense. You could always get a small usb mouse to use with the laptop when you want to play the game. My son is already begging for me to either let him get steam on another computer, or let him use my laptop. Just so he can play Portal. I saw this last night and would have downloaded it then, but I was already about to fall asleep on my keyboard. Figured I should wait until morning/afternoon so I could get some sleep. Also, right when I was reading this blog post in my Google Reader, Portal just finished downloading. Right then, going to play now. anyone else have trouble signing up with Steam? it won't let me past the information page and I don't know why!! Thank you SO MUCH for telling us! I've wanted to get the game for a while, after playing First Slice for so long, but I was debating on when to buy the full game. THANKS, NOW I CAN RELISH IN PORTAL FUN WITHOUT PAYING! >:DDD You don't know how happy it made me to see this. And that cake. It is amazing. 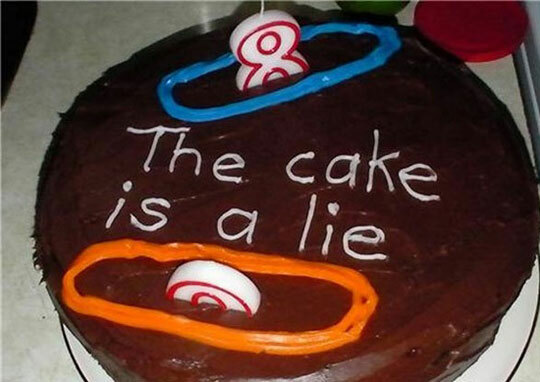 My friend got a Portal cake for his birthday, but due to a communication error, it ended up saying "The Cake is Alive". Seems worthy of a wreck to me... ;) Thankyouthankyouthankyou!!! great. thanks for enabling me in my time-wasting. :D I've already played 11 levels--talk about addicting! I am having a TON of trouble getting past Steam's Captcha. Any advice? Sweet! I have it downloading right now. Oddly enough, this is the first time I've ever gotten Steam to work... usually it just freezes every time I try to log in. Thanks for the heads up! I can't wait to play! I had written a comment on how it almost wasn't worth the money, because steam wouldn't let me create an account - but then Google wouldn't log me on either! The internet hates me today. Thank you for posting this!! I've wanted to play Portal forever (even though I know it's going to have me swearing up a storm), but never felt the need to buy it, even when it was $10 (and I didn't want to illegally download it). This is awesome!! whoohoo! Downloading now! Thank you for the heads up. You are the bestest EVAH! I went to a They Might Be Giants concert last night, and their opening act was Jonathan Coulton, the guy who wrote "Still Alive" (the song that plays during the credits of Portal). AND HE PERFORMED IT! It was so awesome! They had this offer once before and I jumped on it. Great game. Still haven't reached terminal velocity, though. @ Erica T. - You didn't hear a warning that live ammo was going to be used? Solving physics based problems is cool, but the writing is hilarious. I too had some trouble getting past the account-creation stage, even after enabling cookies, etc. I ended up being able to download through Firefox instead of Internet Explorer -- people having trouble might want to try that. And thanks for the heads-up, Jen, I have been very interested in this game! For those having trouble with the Steam's captcha: try installing the Steam platform first (there should be a button for it in the upper right corner). Once that's installed, you can create an account from the platform without having to deal with the captcha. I think part of the problem may be the username check on the website... it told me my username was available, but when I tried it through the platform it was taken. I'm also having problems getting past the captcha part of the registration. You totally prompted me to buy it for the xbox ages ago, when you posted the first ending video thing, and I had heard about it before, but really had to have it then. I got my husband to get it for me 'for my birthday' today. My birthday was a week ago! It wasn't free, but I struggle to play stuff like this on the pc/laptop - something about co-ordinating the mouse and the keyboard just does not compute to me! Have tried all day and it won't let me join Steam (as others have posted). Anyone know why or how to work around?? @Anonymous - THANK YOU! I tired it again by doing what you suggested - going to the top right corner and installing Steam first and then creating my account through there rather than the website and that worked. Like you I found that my chosen username was NOT in fact avaialable despite the website telling me it was. I've got the game slowly downloading now. Jenn, I have never been more in love with you. Thank you so very much! SWEET!!! Thanks Jenn! You're the best! I'm currently on pregnancy bedrest until baby boy gets here, and this is the PERFECT way to spend my time! Then, launch Steam.exe from within the Steam installation folder, and not from a pre-existing shortcut. With Steam running, re-test the original issue. Note: This process will not affect your currently installed games." @musikartlvr I just clicked on the option to let them update my video card and then went back in. It let me play then. @Kenkire I got 19 levels with the free download but don’t know if that’s the full game or not. It didn't work for me. :( I got it all setup and downloaded and it plays the opening credits and then just randomly shuts down. This is awesome! My husband wanted Portal 2, but wanted to play Portal first. I spent one of my nights up (I work nights) scouring the 'net looking for where to even download it! You're the best! I had this idea once of making one of those meatloaf cakes with mashed potato icing, and writing "The Cake Is A Lie" on it. Some call it a prank, I call it a "social experiment." I am now officially addicted to Portal. Thanks for the info. I finally get the Portal geekery. I was having trouble signing up for an account too (and I had been trying since Jen posted this.) Somebody made a good point that even though it says your username is available, it may not really be. So I added a couple of numbers to mine and was able to finally create an account. Also, a tip with the Captcha: keep refreshing it until you get one you can read - that's what I had to do! If there really was a warning that live ammo was going to be used, then I missed it. I tend to play games on mute since my husband plays games, as well. If we both had the volume on, then you'd have a weird mishmash of electronic music. Not appealing. Oh well--that's what I get, I suppose! Thanks for the heads up on this! My 12-year-old has been asking to play, and I couldn't justify the money. You are awesome! Having the same trouble as many others have posted on creating an account. I've tried on two different PC's, two different days, and on both IE and Firefox, if thats helpful to anyone, so it seems it's definitely NOT me! I was so looking forward to playing this game, especially for FREE but have to admit that all this trouble with even simply creating an account is making me have second thoughts. Ironically, I created an acoount with no trouble for their support site, and submitted my question about this issue, but I have serious doubts they will get back to me before the free download time runs out on this game. I got it working on my computer, but I cant get past level 10. It's driving me up the wall. I posted on this post once before, but I hadn't downloaded it then... now, I can only say THANK YOU THANK YOU THANK YOU! My head is swimming after downloading/playing it today from the sheer too-much-screen-time. ....Aaaand I laughed my head off at the robo-tized "wheeeeeeeeee." It seems there are lots of us not able to download...all with the same problems. I am so bummed! After hearing about this game and watching the promo's i thought it was time i got into it. Now i figure it just isn't worth the headache. Tried 5 different times over the weekend. Where once i was only tangentially interested int he game, now i am jealous of all of you who were able to download. Seems i want what i cannot have. Hurray!!!! I'm so excited. I was worried when I saw this (it being Monday and all) but the site says it's available till the 20th (Tuesday) so I made it!!!! :D Guess what I'm doing tonight! Thanks Jen! Thanks! My one friend's never played the game before, so I sent him the link. Now we can make cake jokes together! If you encounter issues when creating an account through the Steam Store, please try creating a Steam account using the Steam client/software. If you encounter any further difficulty, please let us know." Gee thanks guys. Not helpful in the least. Despite the lure of free, I have no inclination to use this service, and instead will likely use the ol' torrents to get at some Portal action.